« Chapter One: Got Friends? Fair question. And one I get asked often in one form or another. It’s both easy — and hard — to explain. I love motorcycles. I love motorcycling. Motorcycles are “my thing” (on a long list of “my things,” by the way, including cars and guitars in the past). But through all my years of learning, longing, collecting and coveting things, nothing has quite taken me the way motorcycling has. My friends who ride will tell you the same thing; riding fulfills something they didn’t know was missing. I’m sure that folks who collect classic cars or guitars often feel the same way, but they’re missing an element that comes out when you’re straddling a hot motor and two wheels, surrounded by hard road, rushing air, undefined smells and subtle (and maybe not so subtle) sounds. I wish I could explain it better, but I’d rather ride and let it be. Is riding dangerous? Hell yes it’s dangerous. The most dangerous part isn’t the bike, it’s you — the human. The immortal/invincible dope on the bike or the tuned-out space cadet in the car. The most common phrase following a motorcycle wreck is, “I didn’t see him.” So yeah, I’m concerned about stuff like that. 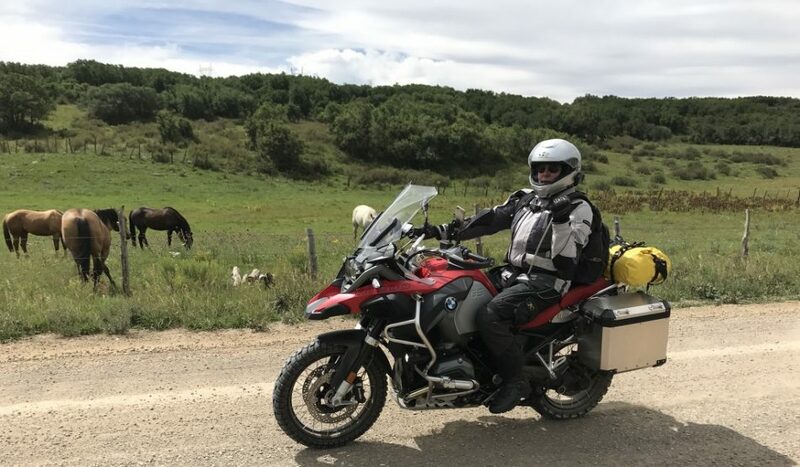 I take safety training courses and try to apply practical tips I’ve learned whenever I ride, but I’m also reasonably certain that I probably won’t see — and can’t control — what’s gonna get me out there, so I don’t live in a world of worry about it. Vigilance can carry me only so far. Horseshit. No rider has ever made this a conscious choice. It’s the last thing I want to do, short of ramming into a left-turning car driven by some distracted idiot texting smiley emoticons to their BFF. So why take the risk? Simply stated: I love traveling by motorcycle. I feel more connected to my surroundings — and that includes the machine itself. Shifting, balancing, turning — all of my limbs are engaged and relying upon each other to get me to my destination. Clutch, throttle, brakes, shifter, all working in concert. It’s beautiful, man. A day of riding is probably the most zen-like experience I know or will ever have. And as for me being just generally nuts? Yeah, maybe. I’m posting this from Victoria, British Columbia. We traveled here from Orcas Island, Washington yesterday by ferry. Victoria has a distinctly European city feel, but it reminds me of Sydney, Australia with its mix of classic architecture, gardens and quaint homes squeezed harmoniously into a small area facing the sea. And I swear it’s true that Canadians are just naturally polite people. Here’s a general overview of our Chapter One route. Snow closures resulted in some route vectoring, but you’ll get the general idea of the ride plan. Found this familiar prop at the ferry dock in Friday Harbor, WA on our way to Victoria. It starts talking when you approach. Kinda creeped me out. I didn’t ask to be “Big” — or to be a teenager again (jeeze.. who would?). We like doing city tours with local lines wherever we go to help us get the lay of the land. This “Mile 0” sign marks the beginning of the Trans Canada Highway. It’s 5,000 miles long and includes two ferry crossings, one in Victoria, the other in Newfoundland. We’ll be seeing more of this highway in Chapters Three and Four. These two beautiful living city orcas are found in front of the Empress Hotel. When I saw them it hit me that I’d found the new name for my BMW K1600GTL. I mentioned in an earlier post that I always name my bikes, but that sometimes it takes a while for the name to reveal itself. Well on this trip, it finally did…. Say hello to “Orca.” Big and powerful like a whale, with killer features that make other predators cower. Other curious things present themselves when you’re learning about your new surroundings. Roll over the bottom of the photos for snide comments. Oft-bleeped TV chef/adventurer Anthony Bourdain swears by the healing properties of a good bowl of greasy street noodles found on a cart in some back alley of Kuala Lumpur. And Tony’s right. I found this bucket of “Don’t Ask” in broth with noodles (actually fried pork belly, egg, onions, radishes and mushrooms) at Foo Ramen in Victoria. Yum! It’s not easy to take a selfie while eating something that slippery. That sounded more nasty than intended. I slurped and slobbered everything in that bowl right down to the deep bottom. Whenever I visit Canada, I make sure to help the economy by consuming locally made products. Lots of locally made products. Dee and I took a day ride around the BC Marine Route. It’s a beautiful and serene 180 mile roundtrip through small villages, virgin forests, over crystal clear streams and finally along a coastline known as “The Graveyard of Ships.” I cannot confirm whether or not the crews of the doomed ships were helping the Canadian economy by consuming the product shown above when their ships smashed against the rocks near Port Renfrew, but I sure as hell would have. Serious Coffee in Sooke, BC sells the best chai latte. Seriously, the best. The famous Empress Hotel stands watch over Victoria Harbor. The hotel offers a High Tea, which is quite popular and costs $75 (Canadian) per person. For tea. And some cookies. I can buy a lot more Molson for $75 (Canadian) and meet new friends much quicker. Probably one of the most beautiful shots taken in Chapter One. The composition of elements, the angle, the mixture of soft and solid and the warm colors gather to form the perfect focal point. It stirs my heart. Oh, and those boats, clouds and water things in the background look okay, too. Thanks for following along on Chapter One. Keep the comments, encouragements and warnings of impending litigation coming. We’ll wrap up this chapter in a couple of days and immediately start prepping for Chapter Two. Dee and Hank, i am thrilled to hear of your adventures . Can’t wait to hear about them first hand. Th e Baja trip is a dream trip for me and of course I’ve always wanted to go to BC. Keep on supporting the Canadian economy! you are a reincarnated cowboy needing to cover a lot more territory….as I recall, you had a similar “relationship” with your horses too!